This weekend is the 30th Anniversary of the 1982 Brisbane Commonwealth Games protests. 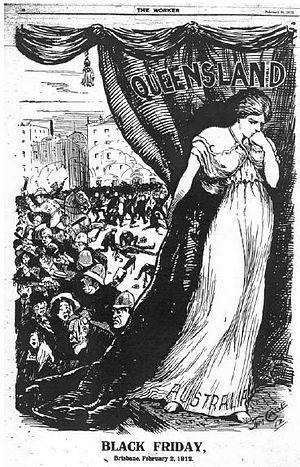 With protest in the air again, history editor Dr Glenn Davies looks at the long history of political protest in Brisbane. 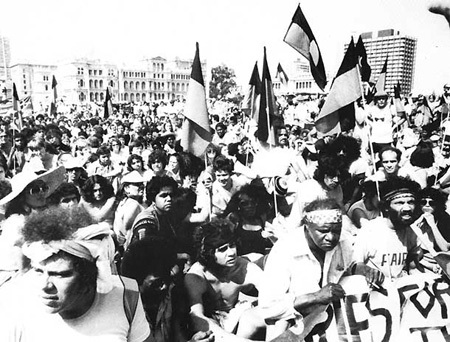 In the 1970s and 1980s, street marches always seemed to begin in King George Square―outside Brisbane City Hall. King George Square was the crucible for the city’s social disquiet and ferment, where thousands of protesters once risked the batons of Premier Joh Bjelke-Petersen’s police force over issues as diverse as the Vietnam War, the Springbok rugby tour, Aboriginal issues, nuclear disarmament and the right to protest. When the protesters went to walk out of the square, there would be hundreds and hundreds of police in military ranks to stop the marchers. As people tried to step out onto the roadway they’d be strong-armed to the ground by police who would try to push them back into the square. However, when Campbell Newman was Lord Mayor of Brisbane he had King George Square completely revamped, removing all trees and shade and making it the type of area anyone would never linger in but rather run through. The destruction of the people’s gathering area seems to have been a long-remembered must-do for the Brisbane Liberals. Brisbane has a long history of protest activity and the new LNP government would be wise not to underestimate the tenacity of Queenslanders. In 1912, during the Brisbane General Strike, more than 25,000 workers – many of who had taken to wearing red ribbons as a mark of solidarity – marched eight abreast in a procession three kilometres long from the Brisbane Trades Hall to Fortitude Valley and back, with more than 50,000 supporters watching from the sidelines. However, the ferocity of the police response on 2 February 1912 is still known as Black Friday. The Red Flag Riots of 1918 and 1919 resulted from a federal ban on the display of the red flag. The Federal authorities were worried about the Russian Revolution of 1917 and had banned the display of the red flag. When Russian and British radicals attempted to march displaying the flag, they were attacked by police. On 24 March 1919, about 8,000 demonstrators and ex-servicemen marched from the city to the Russian Hall in Merivale Street where they clashed again with police. Up to 100 people were injured. On 8 September 1967, a massive illegal march protesting involvement in the Vietnam War occurred after Queensland University students were refused a permit to march. As many as 4,000 students marched from the University of Queensland into the city. During the 1971 Springbok rugby tour, Premier Joh Bjelke-Petersen declared a state of emergency over the anti-apartheid demonstration in Wickham Terrace. The police implemented their new powers vigorously. Following Prime Minister Malcolm Fraser’s decision in 1977 to expand uranium mining, an anti-uranium protest group was formed. In turn, Premier Bjelke-Petersen outlawed street marches, sparking a number of confrontations in the city. However, the "right to march" quickly became the main issue for both the marchers and the police. On 4 September 1977, Bjelke-Petersen announced, “Protest groups need not bother applying for permits to stage marches because they won‘t be granted…that‘s government policy now”. He also announced that demonstrators refused a permit to march would no longer have the right of appeal to a magistrate. You could only appeal to the police commissioner. Political street marches, said Joh, were “a thing of the past”. This prompted widespread protests and protest marches against the removal of this fundamental civil right. In 1978, Premier Joh Bjelke-Petersen’s ban on all street marches led to violent clashes between police and protesters, and the arrest of more than 2,000 people in 26 separate incidents. Tensions rose as the year progressed, with the biggest march of all being in December, when 346 people were arrested and packed like sardines into cells, often being denied a lawyer. There was also a pacifist current to the campaign that favoured disobedience but didn't want it to be militant. On April Fool’s Day 1978, student protesters from University of Queensland adopted a tactic of the No-March or Phantom March. They announced a campus to city march and marched to the edge of the campus where by then 1000 police had arrived and lined up to arrest the protestors once they left the campus. The police stood for over four hours waiting for a march. The organizers then called off the march. "The majority is not omnipotent. The majority can be wrong and is capable of tyranny." The applications were refused. Undeterred, Henry Akers and his dog undertook an illegal march down a quiet street in the early hours of April Fools' Day, watched by a carload of detectives. However, the detectives did not arrest him (or his dog). O'Gorman: Doesn't that highlight the absolute tyranny and absurdity of this law? I'm asking you to comment on that proposition. Bjelke-Petersen: No it does not. Simply because you cannot - If the law is a law it has to be observed. I can't, for example, just go out in the street and block the whole street, even for half a minute ― stand out in the middle of the road and block everything, and neither can he for a couple of hundred yards, same principle. Fitzgerald: But Sir Joh, I think Mr O'Gorman's question is really, might not Mr Akers and Jaffa have been granted a permit without any risk to the public? Bjelke-Petersen: I know he - I beg your pardon? Bjelke-Petersen: Yes, but sir, I'm sure you realise this was just a try-on and just the thin edge of the wedge. Bjelke-Petersen: Well, if it - Did you try to do that? 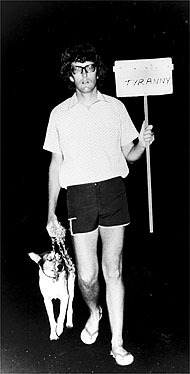 These ingenious protests of ‘refusing to march’ and ‘walking with your dog’ ridiculed the law against ‘the right to march’. They also refuted Bjelke-Petersen's ‘violence argument’, and wasted police resources with no expense incurred to the protesters. The answers from the guest musicians often give an insight into their personality and music history. A similar question can be asked of long-term residents of Brisbane. When and where was the first protest you attended? For more recent Brisbane residents the various protests sweeping across the streets of our town gives them a chance to participate in one of Brisbane’s great traditions. HF Akers, “Civil Liberties – Why Queensland had to compromise on street marches?”; Outlook, 1981, vol. 3, no. 6, pp. 14 – 15. Eddie Clarke, Guardian of Your Rights: Queensland Council for Civil Liberties: A History, 1966-2007; Supreme Court of Queensland Library, Brisbane, pp. 86-99. Mark Plunkett and Ralph Summy, “Civil Liberties in Queensland, a Non-Violent Political Campaign”; Social Alternatives, Vol. 1 Nos 6/7, 1980, pp. 73-90.